I want to spend some time exploring the bike paths when I venture down to Hilton Head next month. 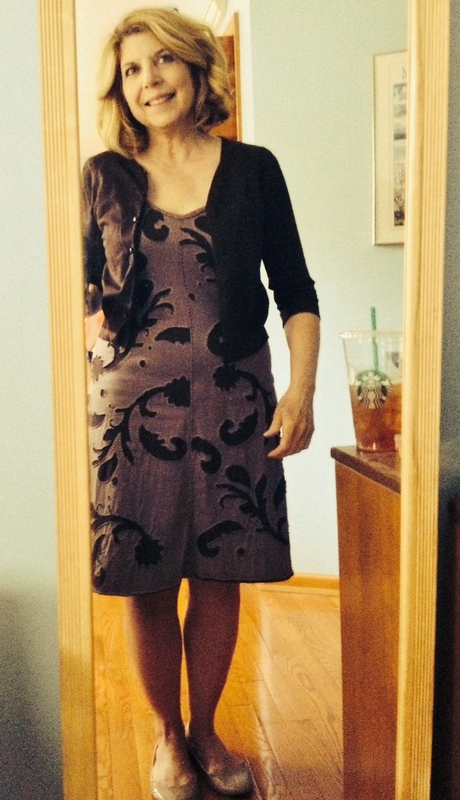 Bike shorts are not my style or speed, I plan on leisurely (lazy) rides and wanted a practical, yet cute outfit. Luckily culottes have made a comeback, with the latest incarnation – midi style. I had visions of the longer length catching in the bike and ripping apart as I tumble off the bike, so going with knee length seemed a safer choice. 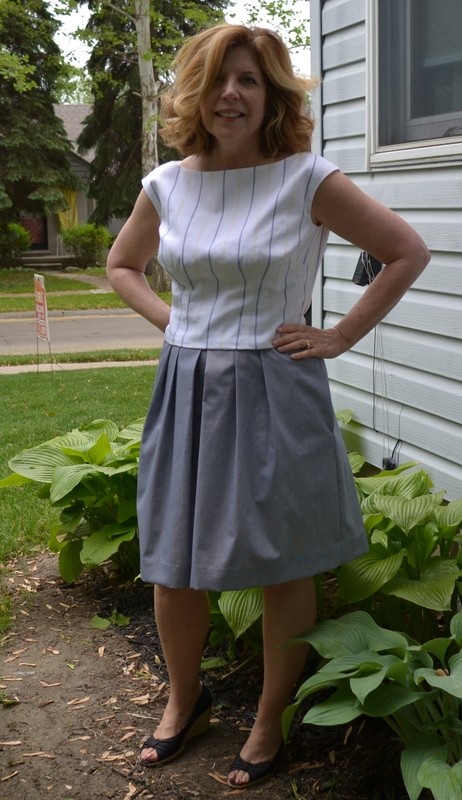 The is-it-a-skirt look was appealing, so I went with Butterick 6178, version A. 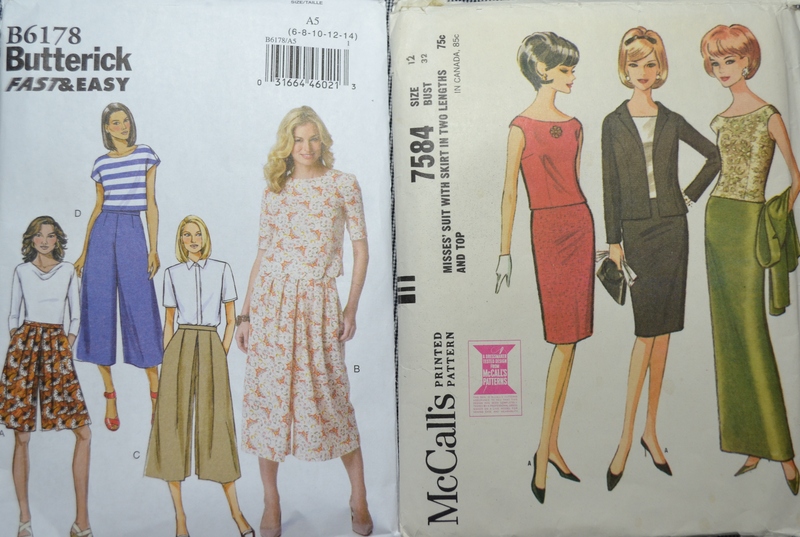 The top for the outfit is vintage 1964 McCalls 7584, my second time with this pattern. The vision in my head had the culottes in blue chambray with a floral print top, but fabric karma was not with me and there was no chambray to be found. Don’t you hate it when you have a project design all worked out and something gets in the way? I’ve been seeing lots of cute chambray skirts on Pinterest and Instagram, so maybe I’ll order some and do a skirt later. This project was on a deadline to be done while my husband was off on a golf weekend. So Plan B, find a different fabric combination. At Haberman Fabrics I found my alternatives. A navy and white (looks gray in the photo) mini checked cotton for the culottes and a striped shirting cotton for the top. Other than yoga pants in yoga class, I don’t wear pants. I don’t like how they look on me and find them to be uncomfortable, especially for sitting. Although the culottes have a loose fit, the lower torso length could still be an issue. I’m short, but oddly long through the area called the lower torso, aka crotch depth. Since I haven’t made any garments needing to accommodate this recently, I had to hit the books. Yep, I’m a shorty with a long lower torso. Adjustments needed. After making a muslin, cutting out the size 12, with the size 14 crotch depth, I made the adjustment to lower the depth a little more. For my normal short person proportion adjustments, I made the waistband 1/4 inch narrower, so it didn’t go up too high on my short waist. With my husband out of town, I spread out and moved my sewing to the family room to enjoy some rare sunshine. I may get a little sloppy when my husband is gone, but he’ll never know. The coffee table can make a good cutting table with smaller projects like the top. 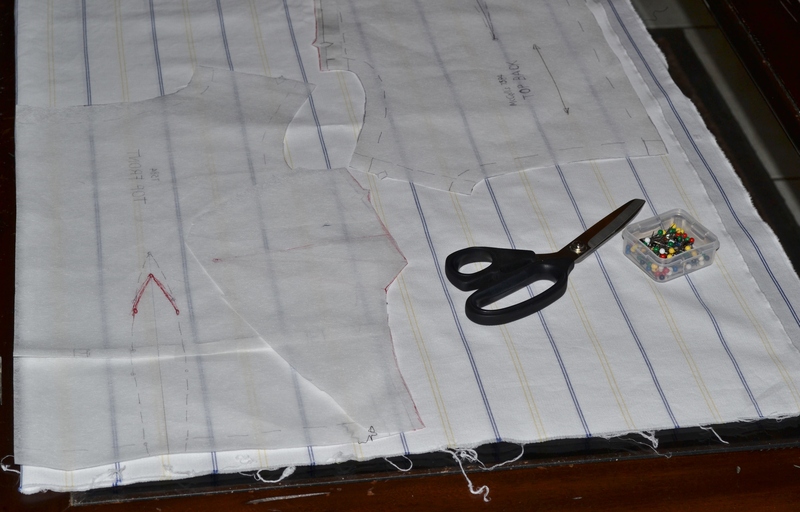 The top pattern was a repeat, fitting previously done, just layout and cut. 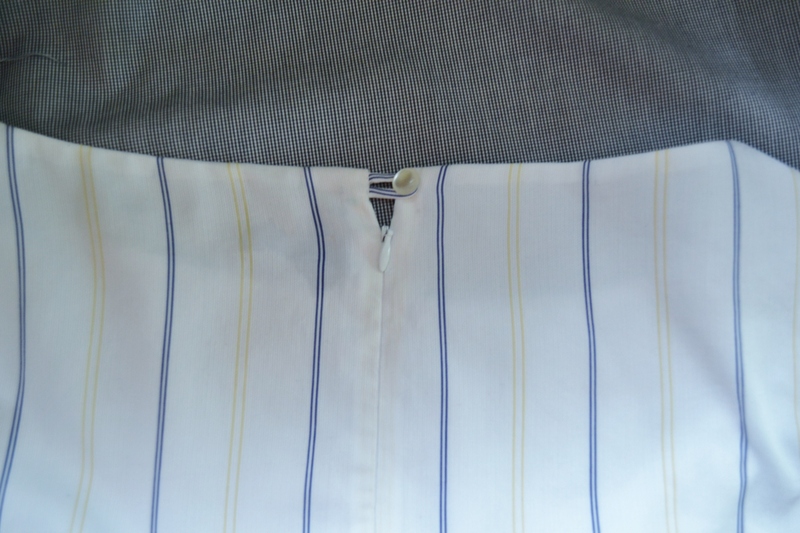 I made one minor change in the zipper, using a 14 inch zipper and adding a button and loop at the top of the back. 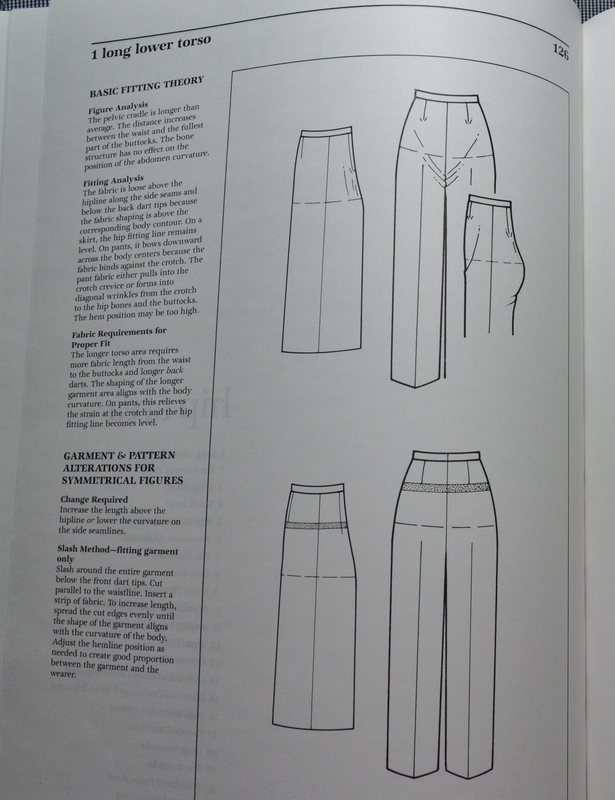 The original pattern instructions call for a separating zipper. I don’t think I’m flexible or coordinated enough to use a separating zipper in the back of a top, even with all the yoga. A comfortable outfit for lazily exploring the bike trails in Hilton Head Plantation. 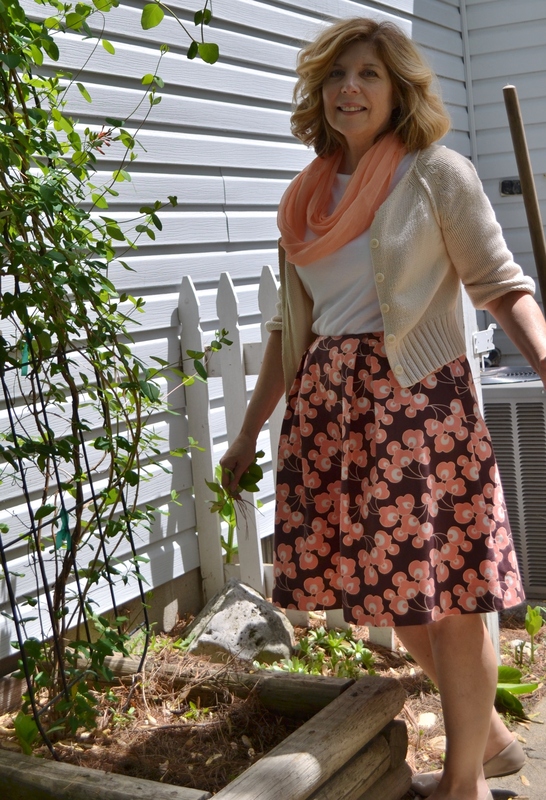 Day 20 – Skirt a hack from dress pattern Vogue 8993 in Amy Butler fabric from Satin Moon in SFO. 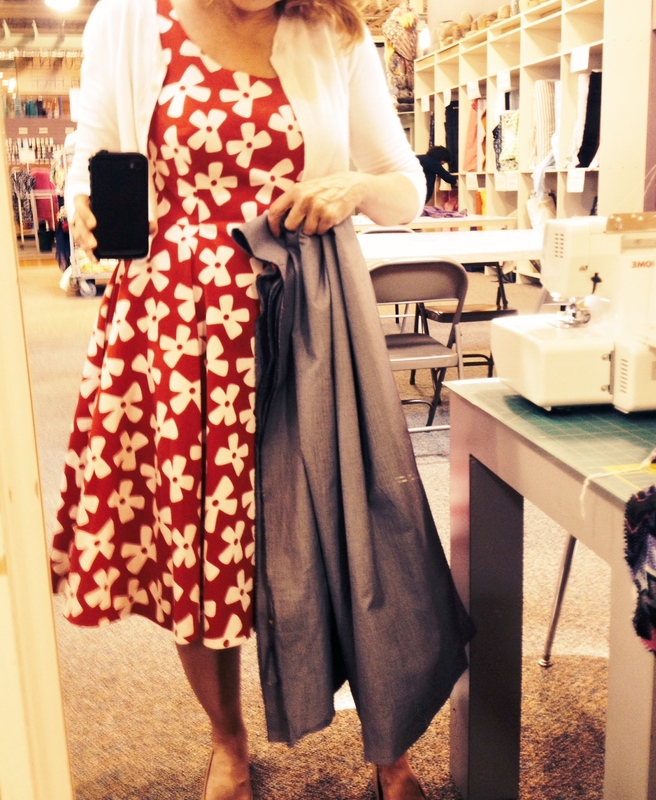 Day 21 – Alabama Chanin fitted dress pattern in organic cotton with back stitched reverse applique. 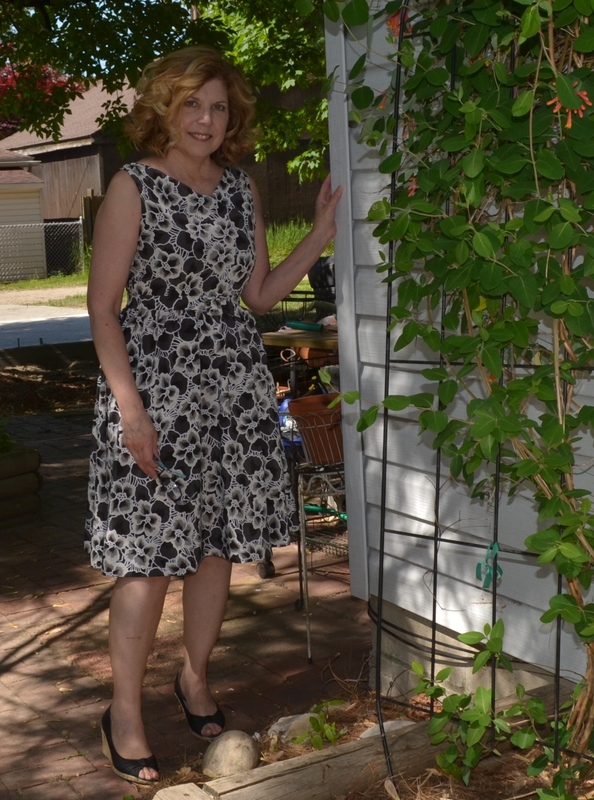 Day 22 – Dress Vogue Patterns 8996 in Oscar de la Renta fabric from Mood. At Habermans Fabrics, checking the drape of the cotton for my culottes. 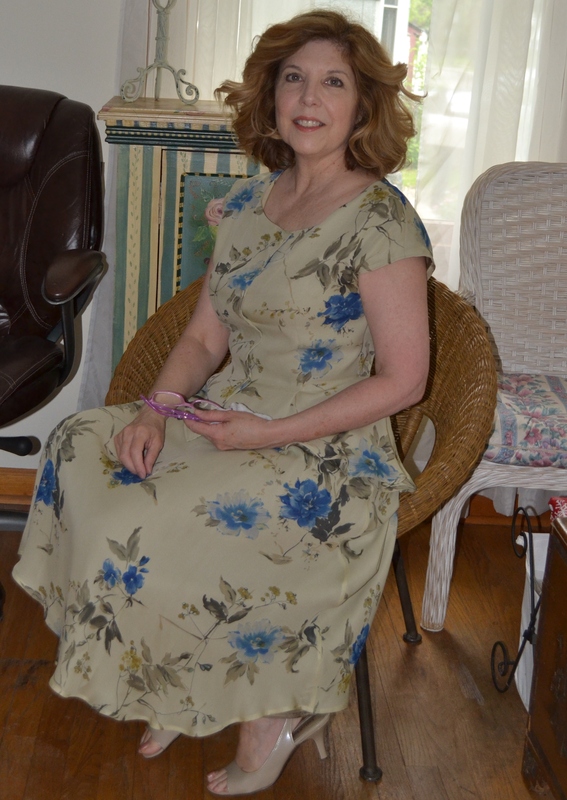 Day 23 – Dress Butterick 6582 Retro 1960 in a poly blend. One more week of Me Made May. I’ve enjoyed seeing everyone else’s postings, it’s been fun. Denise, you are SO stylish! I love all your outfits! You look fabulous and elegant all the time! Hmm, could that be because we have such similar taste? I find I have more energy and get more accomplished if I’m dressed better. I guess clothes are my motivation. Oh that is exactly how I feel! My motto is ….always look your best!!! You look so smart and dressed up, not a bit like what I do when I’m off on a bike ride! It’s a good job your 1000’s of miles away otherwise I’d be tempted to come and raid your wardrobe! You probably ride the bike with some effort, I plan to go slooow. If you come raid my closet I’ll make you stay and teach my how to make beautiful innards on my serger. Darn thing is still in the box. Oh no! 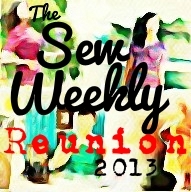 How do you make all those gorgeous garments without a serger?!?! Mine’s nearly 23 years old, and very basic, I generally sew with my sewing machine then whiz it through the serger to make it look nice! Nothing fancy. 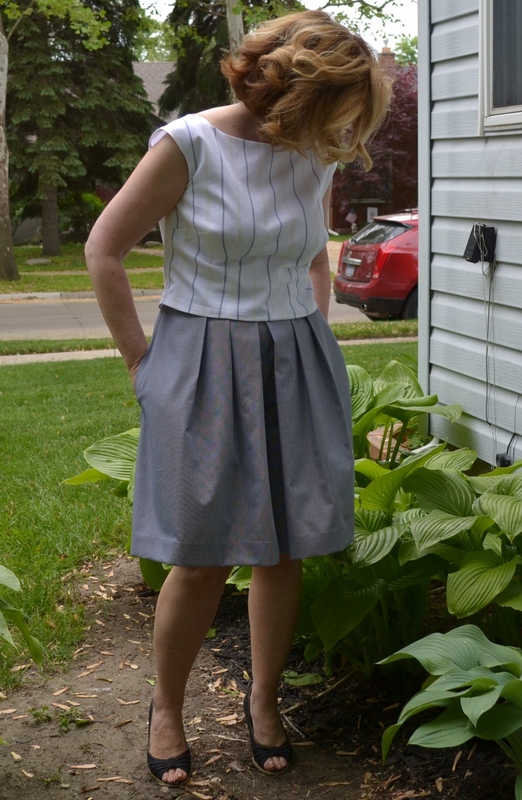 As I’ve been telling the other sewing bloggers at the end of their me-made-may posts, “It’s almost june!” I love the top you made, it looks like it can be dressed up or laid back. Thanks for sharing your outfits with us! Thank you. I am looking forward to June so I can stop taking photos, but I will really miss seeing everyone else’s photos. It has been so inspiring. Love your culottes. The alteration looks perfect! Thanks, they feel good so far. We’ll see what happens when I get on the bike in a few weeks. Really cute and practical! 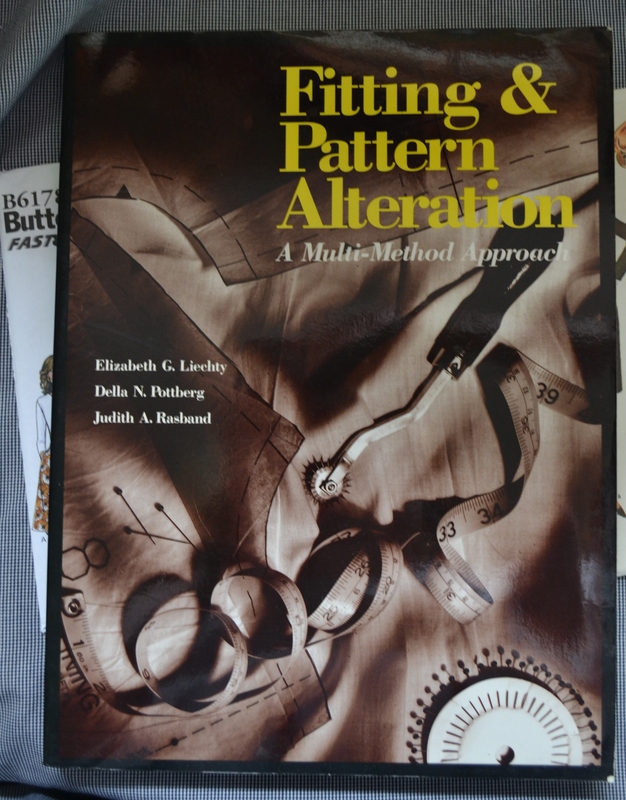 Don’t you love that alterations book? It’s my go-to fit-problem-solving book. Thanks, and yes, its a great book. All the illustrations are really helpful, you can look at the pictures and see exactly what your problem is. Nice to see some culottes that don’t look like it – I like it better when they look like a skirt, like your’s. Nice job! Thanks, I was worried that they would end up looking like all the pleated pants/shorts worn in the 90’s, but the pleats are nice and full and hang well. Wonderful looks. That alteration book is among the best. Thanks, and yes, I agree it’s a great book. I love how I can quickly find exactly what I need in it.